L.A.'s contemporary art museum and its sister restaurant bring a new world of culture and cuisine to the city's downtown scene. Philanthropists Eli and Edythe Broad are as passionate about modern art as they are about their city, Los Angeles. The husband and wife have amassed an exceptional personal art collection that includes more than 2,000 works from 200 important contemporary artists, including Andy Warhol and Jasper Johns. This month, they made that collection public at the long-awaited Broad museum, situated in downtown L.A. in a vaulted white honeycombed building designed by Diller Scofidio + Renfro. It's a defining achievement for the Broads, who have been working to revitalize downtown for 35 years. 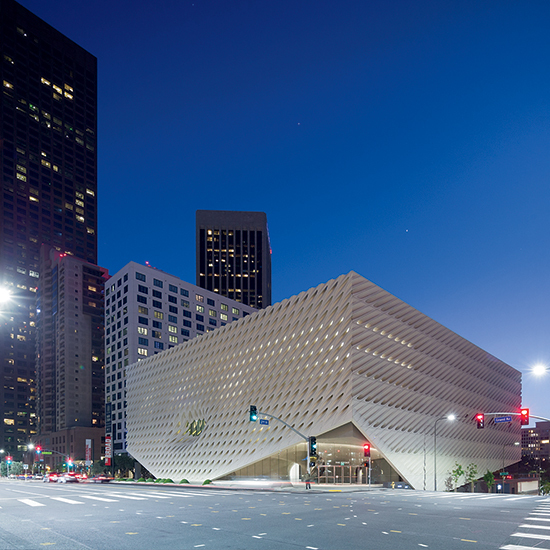 The opening of The Broad is further proof of downtown's status as Los Angeles's cultural hub. The four-square-block area surrounding the new museum is home to some of the most important institutions in the city, like the Walt Disney Concert Hall, The Museum of Contemporary Art (MOCA) and the Central Public Library. It's an astonishingly rich arts community, one that Eli Broad has been dreaming of since 1979, when he became the founding chairman of MOCA. "My wife and I were always drawn to downtown," he says. "L.A. was a city full of suburbs, and it lacked a vibrant center. I knew that a great city needed a dynamic nucleus." Now it has one. Downtown, you can hear Beethoven's 9th, take in an exhibit on black gay identity, check out one of the earliest examples of Art Deco architecture, and see works by Basquiat, Lichtenstein and Koons. And not only that: You can also eat grilled Santa Barbara spot prawns, lamb belly with kumquats or hay-smoked potatoes. In the past several years, pioneering chefs have brought exciting food downtown at restaurants like Ari Taymor's Alma and Neal Fraser's Redbird. With the opening of The Broad, chef Timothy Hollingsworth, formerly of the French Laundry in Napa, has become the newest downtown player. He's been tapped to run Otium, the restaurant affiliated with the museum. Hollingsworth's inspiration comes from the dinners he ate growing up in a family of seven. "I want to bring the experience of family dinner to a restaurant that still focuses on presentation and the best ingredients — but in a comfortable way," he says. That means he's cooking supersimple, homey dishes, heavy on the vegetables (grown on the roof), making frequent use of two giant wood-fired grills and serving almost everything on big platters. He sears garlic-marinated lamb chops over olive or almond wood and then serves them with quick-pickled Chinese eggplant and yogurt. He tosses squash with ricotta and pomegranate molasses. And he makes a rustic autumn tart that's piled crazily high with vegetables. Otium is located on a pedestrian plaza planted with olive trees, directly across from The Broad. Eli Broad says that the museum will offer outdoor art programs there. It's more evidence of downtown's revival. Hollingsworth embodies that both professionally and personally: He moved into an apartment across the street from Otium, so he can walk to work. The Broad, 221 S. Grand Ave.; thebroad.org. Otium, 222 S. Hope St.; otiumla.com. Must-Visit Museum Restaurants In the U.S.